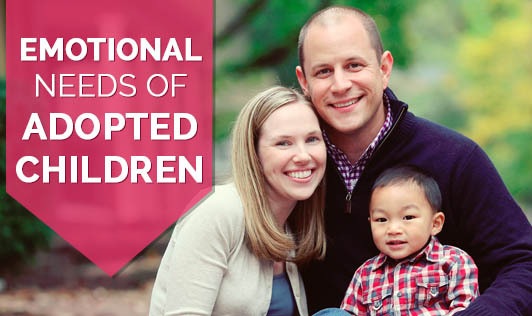 Children who have been adopted have some special emotional needs that other children would not have to face. If you are the parent of an adopted child or children you need to be prepared to deal with the special emotional needs of these children. One problem that you will see with many adopted children is a fear of abandonment. This is more common in children that are adopted an older age. When they feel this fear of abandonment it is up to you to help them realize that they are finally in their forever home. You want to make them feel like they are just as important to the family as any other family member. This will take time, but with care it will happen. Another problem that many adopted children have is fear of losing their possessions. This is because they may have had to leave their belongings behind over the years if they bounced from one foster home to another. You can help them with these feelings by always respecting their possessions and giving them a safe place to keep and store their items. Having their own bedroom will likely help with this. Your adopted children may face some more serious emotional problems if they have been abused or neglected. If this is the case you may want to allow your children to spend time with a therapist or psychologist. This will help them work through any ongoing problems they have, before they turn into lifelong issues. It doesn't matter what their past was like, it is up to you to make these children's future bright. You have taken a great first step by adopting a child, make sure you follow through and help them through any problems that occur. Your family will eventually come together and hopefully everyone will be comfortable with each other. The emotional needs will fade over time as your children become more stable in their new home.